Well I thoroughly enjoyed catching up with the Health Enforcement Team again in this second Health of Strangers novel. In case you haven’t read the first book (and it’s only £1 for Kindle at the time of writing so get yourself a copy) you need to know that a virus has spread worldwide, a virus which is killing many of people who contract it. In an effort to contain it, all kinds of regulations have been put in place including the need for people to carry a Green Card. Without the card, you can’t access vital services, enter buildings or even buy food. To get the Green Card you must attend regular monthly health checks. Miss your check and you will find yourself labelled a defaulter and can expect a visit from the Health Enforcement Team. In this book, Mona and Paterson (aka the Guv) are on an under the radar mission in London tracking down a leading virologist who is rather surprisingly at risk of missing his health check. Meanwhile back in Edinburgh, Bernard is reluctantly under the temporary command of Maitland and with partner Carole is looking for a missing girl who it seems may be a prostitute. Throw in a drug dealer who may have connections to the missing girl and who is looking to expand his empire and the scene is set for more adventures for the HET, perhaps rather more excitement than they would like. What I enjoyed most about this book, as with the first, is the banter between the characters. Despite the sometimes difficult situations they find themselves in, real danger at times, there is always an undercurrent of dry humour. The story alternates between the action in Edinburgh with Bernard and the investigation in London with Mona. I have to say that Lesley Kelly has done a brilliant job of creating mini cliffhangers throughout the book so that each chapter ended with me wanting to know what happens next but having to wait until the next part about those characters. It’s quite a skill to be able to keep that up throughout an entire novel I feel. It was good to get more of a feel for the characters outwith their working lives too and I particularly liked the scenes with Mona and her mum which were down to earth yet tender. Bernard is someone I feel sorry for and am fond of in equal measure as he goes about his work conscientiously but despondently, knowing how disliked he and his colleagues are. And special mention must also go to Theresa, the Professor’s assistant, also known as Maggie. She is a brilliant addition to this book and although I suspect we might not see her again, I harbour a hope that we might. 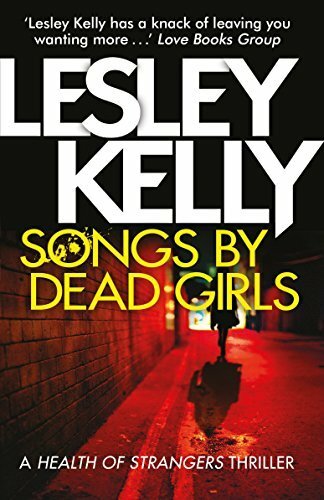 Songs by Dead Girls is a thoroughly entertaining read which rattles along at a lively pace. It’s witty and full of brilliant characters you will both love and love to hate. A sneak preview at the end of the book has me looking forward to the third book in the series (Death at the Plague Museum) and catching up with Bernard, Mona et al very soon. When Scotland’s leading virologist goes missing, Mona and Paterson from the Health Enforcement Team are dispatched to London to find him. In a hot and unwelcoming city, Mona has to deal with a boss who isn’t speaking to her, placate the Professor’s over-bearing assistant, and outwit the people who will stop at nothing to make sure the academic stays lost. Meanwhile, back in Edinburgh, Bernard is searching for a missing prostitute, while Maitland is trying to keep the Chair of the Parliamentary Virus Committee from finding out quite how untidy the HET office is. Lesley Kelly has worked in the public and voluntary sectors for the past twenty years, dabbling in poetry and stand-up comedy along the way. She has won a number of writing competitions, including the Scotsman’s Short Story award in 2008. Her first novel, A Fine House in Trinity, was long-listed for the McIlvanney Prize. Her second novel, The Health of Strangers, was published in June 2017 by Sandstone Press. Hi! Looks like a fantastic read! 😉 Going to add this one to my TBR!